Baby girl is 36 weeks in!! I have my doctor’s appointment June 1st – with the nurse practitioner this time – and I plan to ask about a cervical check again, if it isn’t offered to me. I’m hoping for at least a centimeter of progress. I’ll try and get a labor watch post up that day to keep you in the loop. Thursday also marks the beginning of my four day weekend!! Can you spell excited? So far everything seems to be going well. Baby girl is still having her wake and sleep times. She is maxing out her quarters and I’m noticing some, dare I say it, purple lines on my belly that can only mean one thing – stretch marks. I think that most of them are old ones that are stretching out further but it is surprising to me because I feel smaller with her. I suppose in comparison to my last week’s belly shot, she has definitely grown though. I have started taking my raspberry leaf tablets to help my labor, I really felt like it did some good last time so I’m doing it again. Symptoms are pretty much consistent. Sonic ice, fatigue, insomnia, mega heartburn – I slept in the chair last night for a bit, starting of hemorrhoids and loss of small pieces of my mucus plug to name a few. New this week is increased discharge that is not mucus, slight swelling of my fingers in the morning – it usually depends on what I eat the night before as to the degree of swelling, but it goes away after I’ve been up a while – which goes with my very slight rise in blood pressure. Its usually in the high teens over something in the sixties. It has been riding right at 120-128/69-78 which is still good, but slightly higher. At my last appointment the nurse said it was probably due to having extra fluid around a growing baby. My nose has been stuffy in the mornings even though I have been running the humidifier every night. I think its just my blood vessels widening all over my body to handle the extra blood that I’ve got now. I have also noticed, maybe twice so far, that I can see baby girl taking practice breaths. Its so neat to watch. Its definitely not hiccups, but it is a VERY subtle up and down movement off to my left side that very much resembles the rise and fall of a newborns chest when you watch them sleep – somewhat quick, but not in time with my pulse, so I know its not me. That has made me very hopeful that she is getting herself ready to come into our side of the world soon. I always say it, but I can’t wait to meet you little one! 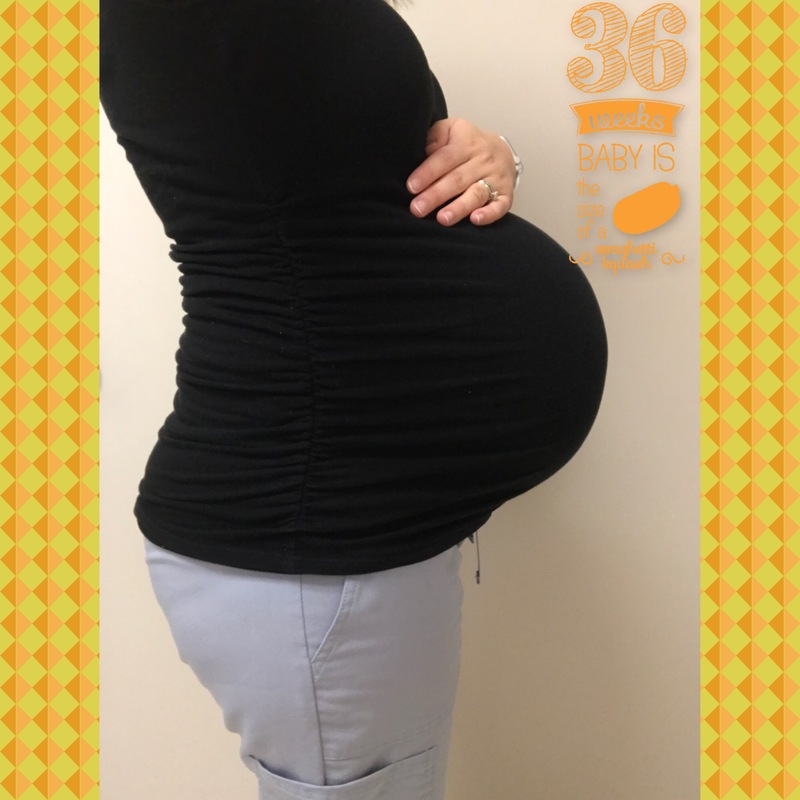 This entry was posted in Family in the making and tagged 36 weeks, baby, bumpdate, pregnancy, pregnancy update, pregnant, prego, update. Bookmark the permalink.